I’m writing this from my front porch somewhere near the center of Lexington, Kentucky. My dog is snoozing to my right. I have the remainder of this afternoon’s iced coffee (which was once this morning’s hot coffee) on my left. I’m finishing up the day’s work on my laptop. I’m about as content as can be. The only thing that would make me happier is if my horse was here with me. He lives about 25 minutes away by car, which is about as far as I feel like traveling most of the time. I like being at home. I wasn’t always this way, but I guess as I get older and more boring, I find that, besides the barn, home is really where I want to be. However, on occasion something inspires me to want to take to the open road. Like when Stacy Westfall and family packed up their lives to spend a year or so as nomads, I felt sort of wistful, wishing I could do the same. 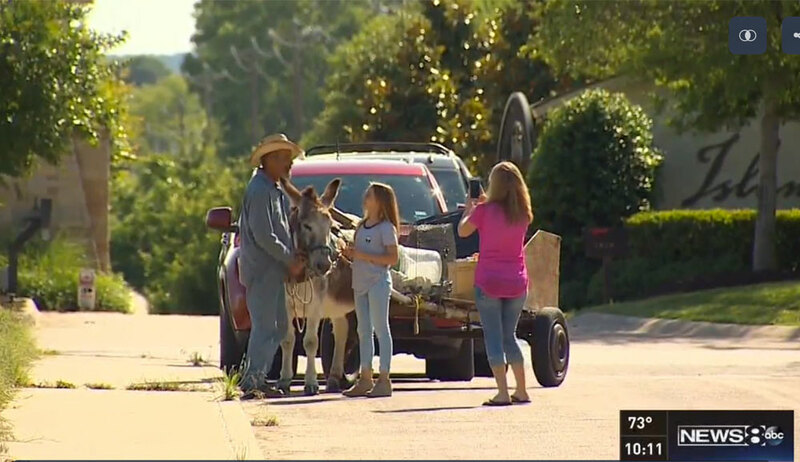 A while ago I came across this story of a man named Charlie Hill and his donkey, Smokey. Hill has been wandering around Texas for a few years after growing “tired of the industry.” Hill had worked in commercial shipping. 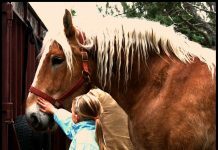 He acquired Smokey from a farmer in West Texas who was going to put him down (or turn him loose, depending on the source). Now the pair wanders together. They don’t have a roof of their own to bed down beneath, but are they homeless? Hill says no. They’re on an adventure. Where are they going? Wherever they want. Hill’s wanderlust isn’t new. Before he took to walking along the shoulder of the road with Smokey, he rode across Texas on his bike. Before that, he says he spent seven years sailing. Just sailing. Hill’s boots appear to be held together with duct tape in the video from KHOU posted earlier this month, but Smokey wears Easy Boots to protect his hooves through the miles on pavement. Smokey also drinks Coca Cola from the can and gets all the carrots a donkey could ever need thanks to the “Will Work for Carrots” sign on the back of his cart. These two wanderers depend largely on the kindness of strangers, and they seem to attract attention—and kindness—from curious Texans wherever they go. There are a lot of factors at play when it comes to homelessness (or adventure), even when it’s by choice, and Hill’s story may not simply be the quietly inspiring tale that the news coverage paints it to be. But still. If you’ve ever had one of those minor existential crises that makes walking away from it all seem appealing, Hill and Smokey do seem a bit like heroes, even if you’re a confirmed homebody like me. cool, would love to come across him and meet him!